Liquid is pumped through the central channel of the cartridge from the bottom of the body. Suspended particles are retained on the filter media resting on the filter plate. Clean filtrate emerges out from the peripheral holes of the plate, into the tank and comes out from the bottom outlet. Filter tank wall does not come in contact with the un-filtered liquid, hence remains clean. Zero Hold Up of filtrate with out scavenging operation. Tank does not come in contact with unfiltered liquid, hence remains clean. Fast & easy removal of filter plate cartridge due to top dome design. Hence easy removal of cake.Uniform filter cake & aid distribution. 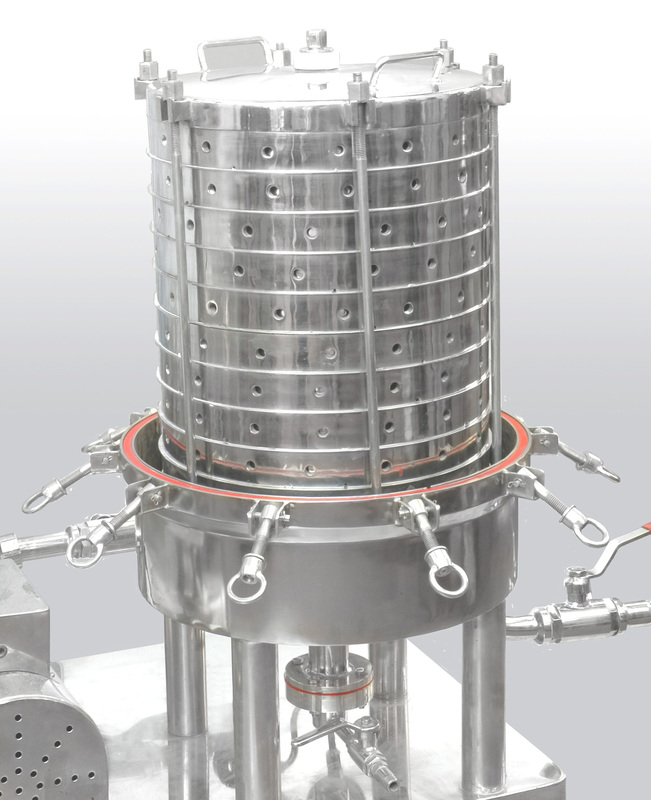 The horizontal sparkler type filter is the most versatile filtration system for solid – liquid separation. It can also be used apart from filtration, with the help of filter aids for giving a sparkling effect to the liquids filtered. The filters are most suited for the filtration of products for the pharmaceutical, chemical, distillery, beverage, ink, oil and other allied industries. It is available in different output capacities with a variety of pumps to suit individual requirements. Horizontal Plate Sparkler Filters:- horizontal sparkler type filter is the most versatile filtration system for solid – liquid separation and available in different output capacities. The filters are made out of Stainless steel in S.S. 304, 316 & 316 L qualities. The cartridge assembly consists of a number of disc type filter plates with perforated support screen, filter media and interlocking cups placed one on top of the other and supported at the bottom by a cartridge plate. The entire assembly is held together with the help of side tie rods which are of ‘T’ type construction for longer life. The filter together with the pump and interconnecting piping is mounted on a sturdy base cladded with S.S. sheets and provided with castors for movability. The filter can also be supplied without pump, where external positive pressure is available. The liquid to be filtered is passed into the vessel by means of the pump or other external means. The liquid then passes through the top of the filter plates from the holes provided at the side of the plate and onto the filter media. The liquid flows simultaneously and individually through all the member plates. Hence the output of the filter depends on the diameter and the number of plates. The filter media then retains the impurities in the liquid and the filtered liquid passes through the central channel to the outlet at the bottom. The filters are optionally available with steam jacket for filtration of difficult liquids that solidifies at lower temperatures. These types of filters are generally used for obtaining clear filtrate, but it can also be used to obtain the cake that is retained on the filter media, between the plates. The complete filter plate is manufactured by cold process. The sealing of the filter plate is done by the spinning process for better sealing. The cartridge assembly is provided with ‘T’ type side bolts for longer life. The filters are provided with gear/centrifugal/lobe pumps fitted with mechanical seals as per requirement. 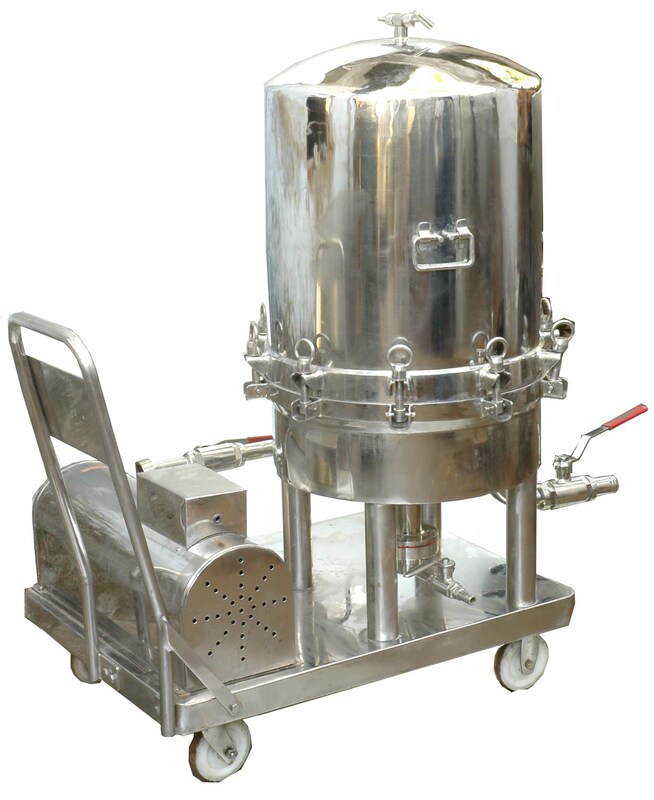 Optionally available with steam jacket for heating of liquids at the time of filtration. The unfiltered liquid remaining inside the shell at the end of filtration can be filtered by scavenging operation, opening the single plate valve and applying pressure from the vent using compressed air or nitrogen / inert gas, so that even the last drop of unfiltered liquid passes through the bottom plate. It is available in 14” & 18” Dia models as a standard and can be provided in 33” Dia model on request. FLOW RATE Ltrs / Hr. * - Mechanical Sal is provided with Tungsten carbide VS Tungsten Carbide face combinations.